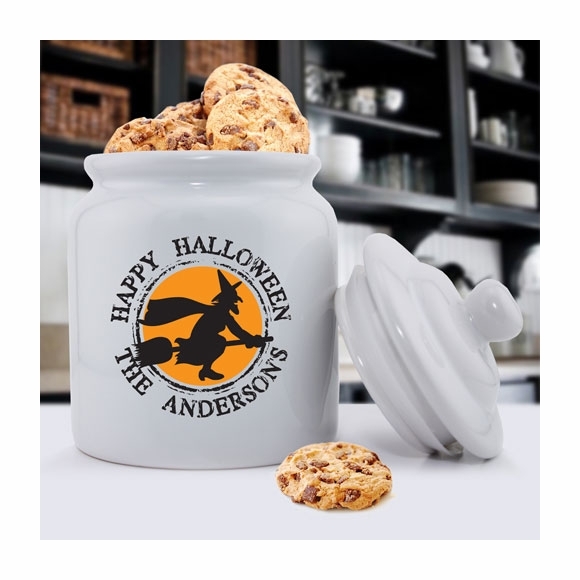 Personalized Halloween Cookie Jar - - Happy Halloween cookie jar features a witch flying in front of an orange moon. Personalize with a family name up to 12 characters. Personalization will appear as shown in all capital letters with the word "THE" before the name. Traditional ceramic cookie jar with top. Plastic ring inside the lid locks freshness in. Dimensions: 5" round x 8.25" high. Color: white ceramic cookie jar with black writing. Ceramic jar holds cookies, candy, nuts, flour, sugar, tea, coffee, rice, pasta, pet treats, and more.